Being the leader in the industry, we manufacture and supply exclusive range of Stainless Steel Trolley. The range is high in quality. 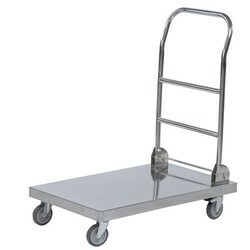 We have mastered the art of providing our clients with exclusive range of Stainless Steel Trolley. This product is crafted by high quality stainless steel. This product does not corrode in any condition as the material with which the array is made supreme in quality. Stainless Steel Trolley is compact in design and can be moved from one place to another with the help of small wheels fitted at the legs of the array.